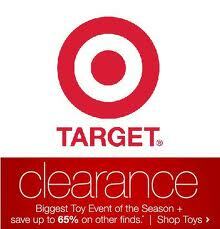 Home > Clearance Deals > Annual Target Toy Clearance Has Begun! Annual Target Toy Clearance Has Begun! Every year during the first or second week in January Target stores mark down all their overstock toys that didn’t sell for Christmas. Well many of you are reporting that your stores started marking things down TODAY! These sales can be HUGE guys. Last year we got toys for almost every birthday party we went to this year, plus presents to giveaway. To give you an idea, this included Pictionary for $5, Curious George Push Toys for $3, Thomas Tanks for $2, and a lot more.